Fed 2 adults, 2 hungry teenagers and a 6 year old! Seriously? This really shouldn’t work – but crickey heck it really is awesome!!! The cooking in coke gives the roasted gammon (ham!) a very subtle sweetness and tenderises it a treat! 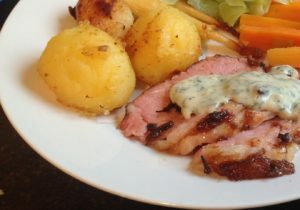 Before I go on, credit where it’s due, this roasted gammon recipe is the brain child of Nigella Lawson. We just finished our Sunday roast and had this roasted gammon in coke recipe with roasted potatoes, honey roasted parsnips, carrots, leek and parsley sauce…there was not a scrap left on anyones plate! (A rare occurrence in out house :-). Remove the gammon from the pot and allow to cool slightly. Remove the skin and score the fat in large diamond shapes. Poke the cloves in at the intersection of the diamonds, smother carefully in black treacle and sprinkle over the mustard powder and Demerara sugar. Take out of the oven, carve and serve. We served this with an easy honey roasted parsnips recipe…enjoy!! I wonder if mixing coke like this will make a good taste. It definitely look good, I will give it a try. Let me try this recipe today. Thanks you for sharing this recipe. I must say quite innovative recipe. Roasting gammon in coke made the flavours emerge very well in it. I tried it out and everyone in my house loved it. I have tried this recipe sometime back. But it did not turn out very well. Now I have found this recipe and will try this recipe. Hope it turns out well this time. Will keep you posted how it turns. I wouldn’t worry too much about the brand but I would avoid using any kind of diet coke.